It all began with a correspondence between two quite different women: 28-year-old Sara from Haninge, Sweden, and 65-year-old Amy from the small town of Broken Wheel, Iowa. After years of exchanging books, letters and thoughts on the meaning of literature and life, Sara, mousy, disheveled, who has never been anywhere in her life--has really lived only for her work in a beloved bookshop, which has just closed its doors for the last time--bravely decides to accept her unknown friend's invitation to visit. But when she arrives, she finds her house empty, the funeral guests just heading home. . . Sara finds herself alone. And what choice do the inhabitants of Broken Wheel have but to take care of their bewildered tourist? And what choice does Sara have, faced with a town where nobody reads and her desire to honour her friend, but to set up the perfect bookshop with all the books she and Amy shared--from Yann Martel's Life of Pi to Iris Murdoch and Jo Nesbo, to Bridget Jones and Doug Coupland's All Families Are Psychotic, Little House on the Prairie And then watch as the townsfolk are, one by one, transformed in unexpected ways. 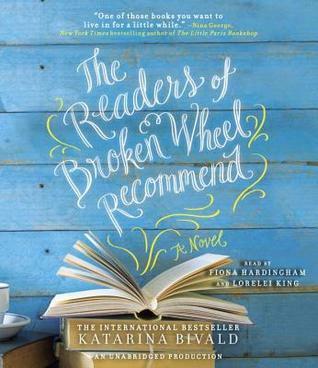 . .
As I listened to The Readers of Broken Wheel Recommend I fell in love with this funny little Iowa town where if we're being honest the inhabitants mostly didn't really read! As the farms have been sold off the town has fallen on poorer times and there isn't too much optimism around. At the invitation of Amy, Sarah arrives from Sweden into their midst. Amy and herself have been correspondents over their love of books and has invited Sarah to the town. Only trouble is Amy has just died as Sarah arrives in time for the mourning. The town takes Sarah under their wing and she finds she has to pay for nothing. The people of Broken Wheel are a motley group, there is Caroline the church warden, right and proper who has a running feud with Grace over at the diner. There is George whose wife left him and whose job it is to drive Sarah around the town wherever she wants to go. George took to the bottle when his wife left with his daughter but now he seems to be pulling himself up. There is Jen who writes the newsletter and perhaps tries to write others lives. There is John, an African American who for the first time ever felt safe in Broken Wheel and he had a special relationship with Amy. Then there is Tom and Andy, who are about the same age as Sarah. What Sarah does by her very being there is to bring life and new hope to the town in ways she can't even understand and its all through books. As a reader I loved this aspect and enjoyed all the bookish references and Sarah's love for books. We get to meet Amy through her letters which are peppered throughout the story. She too has a great love for books and also has little wisdoms and insights to share about both books and the people of the town. I found it a warm, funny story that lent itself well to being presented in audio by the two narrators. One voice for Amy's letters and the other for telling the story and all the goings on in the town. They both narrated well, Lorelei King who presented Amy's voice sounded older and warmer and really brought Amy to life. Fiona Hardingham was pleasant and differentiated the voices of the ensemble cast enough to add interest. There presentation made me really care for the characters. I received this audiobook from eStories. It was a site that I found easy to use. I have this one on my bookshelf and want to read it. Sounds like a feel good story. I like eStories too. Omg what a great premise. wonderful review it's definitely going on my list! This sounds like a good novel and maybe even better listened to. Thanks for sharing your thoughts on it! This sounds so charming. I'll have to see if my library has a copy. I love books about unlikely connections...and how people bond over the books they share. Thanks for the great review. I was pleased with eStories app as well. This book is on my TBR and I'm so glad to hear you enjoyed it. It sounds like an absolute delight to read/listen to! I really enjoyed this book....a sweet read for me. Oh and this sounds like it has several different emotions going for it. Great review! I will move up this book, Kathryn. I like it when there is a town of fun characters and they're connected by someone or something. I bought this book Saturday and look forward to reading it. Sounds charming. I think I will get it on audio in the near future. Thanks for sharing your thoughts. I had this one through my library, and the loan expired before I got to it! Sounds like I need to request it again!